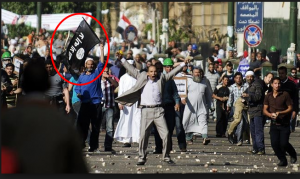 Aljazeera network caught airing fake news on 6 & 7 October 2013, about Muslim Brotherhood protests and what is going on in Egypt. They are working hard on spreading lies about Egyptians are divided and in the meantime, they claim that all the Egyptians are protesting in millions marches against what they claim “the coup”!. How come the community is divided, and at the same time the whole community is supporting Mohamed Morsi and against “the coup”?. 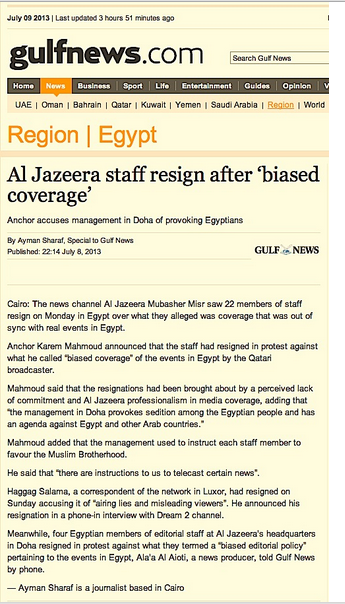 This not the first time Aljazeera fakes news about Egypt, and it won’t be the last time either. But it is our duty to show the world and the international news agencies, the violations of Aljazeera network to the Media code of Conduct. International medias are still spreading that lie too, just like Aljazeera is doing, that Egyptians are divided. No they are not. Ask your correspondences to Do their homework and find out the truth. Egypt is facing terror by International terror Organization called Muslim Brotherhood, Brotherhood are taking advantage of ignorance and poverty of some of the Egyptians and are paying them and using them under the name of religion, convincing them that they must fight the whole Egyptian community, because the community is atheist and fighting Islam. Just like they are paying Terrorists to commit terror attacks against the whole community. 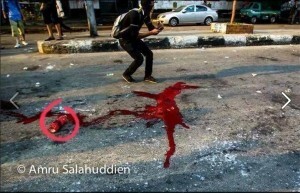 That’s what is happening in Egypt. 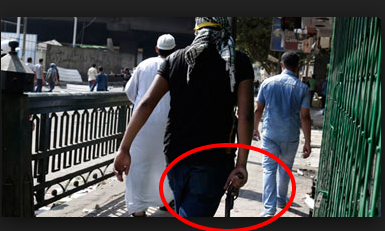 When you talk about division in the community, I challenge anyone who can say that Egypt is split into two, Egypt is fighting terror and those who commit violence under fake peaceful demonstrations, they are killers and they commit terror acts and damaging private and public properties, thinking that doing all that will get Brotherhood to rule again and will terrorize a whole country. The police in USA shot a woman dead just because she hit plastic barriers, they thought just thought that she was breaking in, and she was not damaging any private or any public properties, she did not torture anyone and she certainly did not attack people randomly in the street or shot them randomly or killed any military or police individuals, but they shot her dead because she hit some barriers. Brotherhood and their criminals supporters want to paralyze the economy of the country and are committing terror acts against the whole community, and you guys are saying, that Egypt is oppressing MB violent demonstrations and violating MB terror rights and Egyptians are divided into two!!! What a double standard and barefaced lies and supporting to terrorists the international news medias are committing against our country! Don’t you feel any shame!!! By the way, where were you guys when Brotherhood were oppressing, killing and torturing Egyptians and attacking all the official institutions in Egypt from the first minute they ruled Egypt? Where were you, we haven’t heard your news, when Brotherhood and Mohammed Morsi were issuing general Pardon for the terrorists who killed 58 of your beloved in Luxor Massacre 1997 and terrorists who were involved in killing military, police individuals, late president Sadat, Writers, Journalists and civilians during the 90’s and they were condemned to death or jailed for life, and Morsi your big terrorist ally, gave them general pardon, to get out and slaughter anyone who demonstrate against his fascist regime? Where were you???!!! International News Agencies are working for free or for money, who knows, to spread lies on behalf of an International Terrorists Organization called “Muslim Brotherhood” – and at the end of each bloody violent day committed by Brotherhood and their paid supporters, you guys are coming up with just one conclusion: Oops! The Egyptian community is divided! and you never bother to move in checking the horrible crimes they are committing against a whole community. Do you really believe your selves! I wonder why you consider Al-Qaeda a terrorists organization! Al-Qaeda, in case you are ignorant is coming from Brotherhood Uterus and Brotherhood consider Osama Bin Laden the Hero who humiliated Americans. I wonder what would you do or say, if a bunch of killers terrorize civilians in your country and burned and damaged private and public properties? would you then say that they have the right to demonstrate in that violent way and the country is divided! I don’t think you will say anything, you will just shoot them like US police shot that Woman!!! 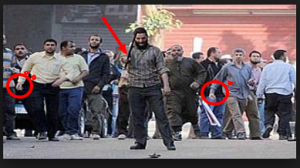 Before you see the documented violence of Brotherhood supporters on the 6 and 7 of October 2013 against the Egyptian community, I would like first to document the fake news of Aljazeera and Brotherhood, I just picked some samples of their lies and fake news. 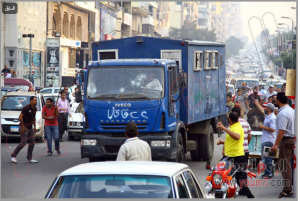 On 6 October 2013, Egyptians celebrated the 40th anniversary of the 6 October 1973 war victory, despite the Brotherhood threatens of turning that day bloody in the whole country by spoiling it. On 6/10/2013, I published an article warning the international news agencies from Aljazeera airing fake news, what I mentioned in my article, was exactly what happened. 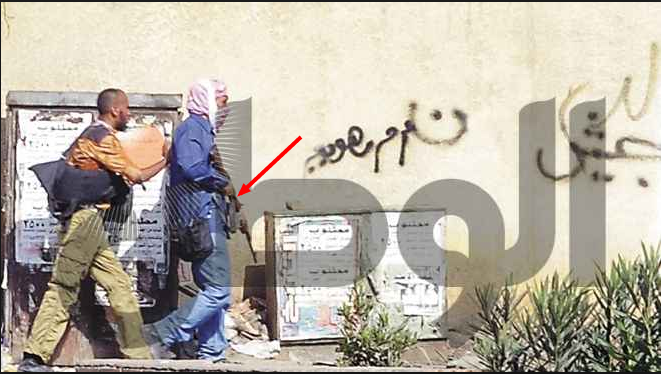 Aljazeera fakes images, videos and news, as well as not publishing what is really going on in Egypt and they deliberately ignore the violence and crimes committed by Brotherhood and their supporters against the whole Egyptian Community. 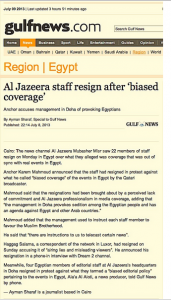 Aljazeera is not just airing fake news about Egypt, they are airing forge and fake news about many Arab Countries as well, who are on their Agenda, like Syria and Bahrain. 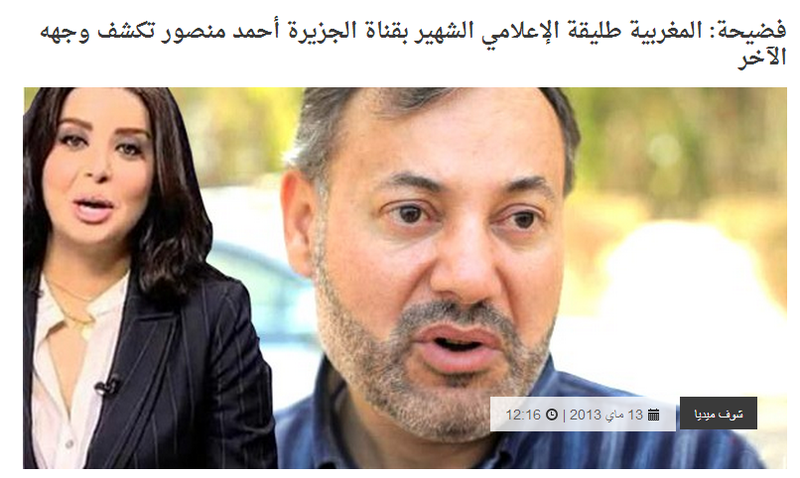 In the meantime, they do not publish any news about certain countries, specially those that are having a revolution or demonstrations against regimes that Aljazeera is supporting: Like Sudan – Turkey and Tunis! 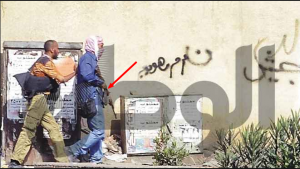 Aljazeera never criticize or publish news about any Brotherhood regime or regime that is supporting brotherhood, if the people are uprising against the Brotherhood regime in any Arab country, Aljazeera never air any news about it! 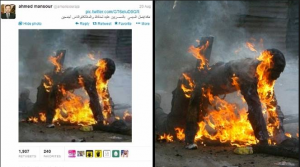 The following screenshot, published by Aljazeera, Ahmed Mansour famous host, Aljazeera claimed that the following image is one of the Brotherhood supporters, got burned alive by the Egyptian Military and the Egyptian Military is burning brotherhood supporters alive!! If you search on the internet to check the truth about that image, you will find out that the original image belongs to an African protester during 2008 in the disengagement of South Africa’s protest! Ahmed Mansour works in Aljazeera publishing fake news and images about Egypt. 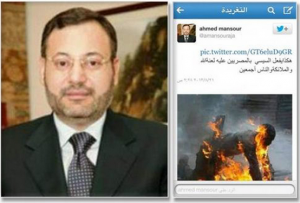 Who is Ahmed Mansour, Aljazeera very famous host? Ahmed Mansour the famous Interviewer and presenter on Aljazeera Channel, instead of respecting the Media code of conduct in acting neutral in not taking sides, he is leading personally an incitement campaign against more than 37 million Egyptians who made a revolution on 30/6/2013, and inciting Muslim Brotherhood supporters on changing and challenging the will of millions of Egyptians and he called the 30/6/2013 a fake revolution. 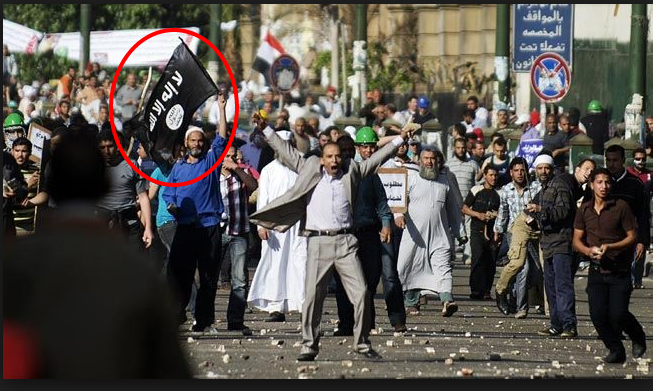 He also announced his support to Mohamed Morsi ousted by millions of Egyptian’s will on 30/6/2013. 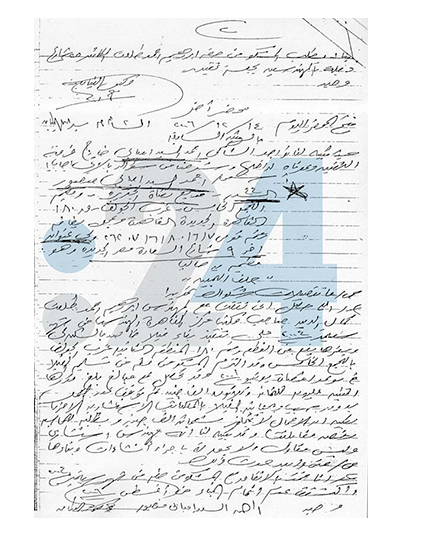 Ahmed Mansour was accused in 1983 of theft in Almansoura City, while he was studying in Almansoura University, and the man he robbed was begged by Ahmed Mansour’s family to withdraw his statement, because he was going to jail and was going to lose his future in the university. 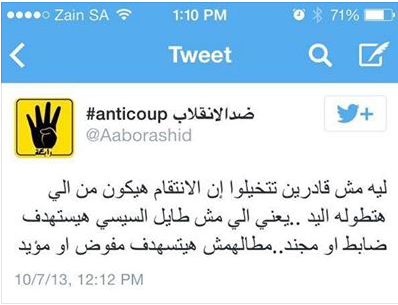 The following is a screenshot, issued by Almansoura University, which suspended him from the university due to the theft crime. The man that he robbed called Ibrahim Salem Alokda from Almansoura City, he withdrew his statement against Ahmed Mansour, after he insisted that Ahmed Mansour returns back all the stuff he robbed. 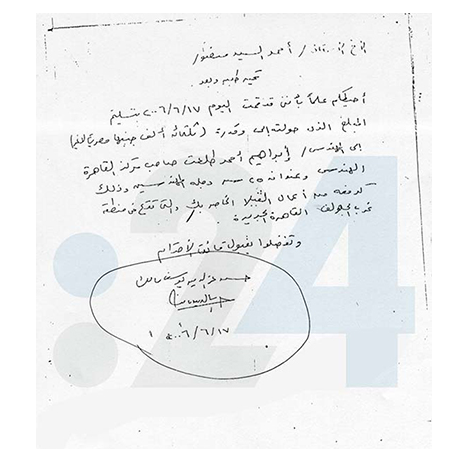 The following original document is issued by the University, asking that suspension against the student to be dropped, so he doesn’t lose his whole future and career, specially after he returned back all the stuff he had stolen from the victim he robbed! 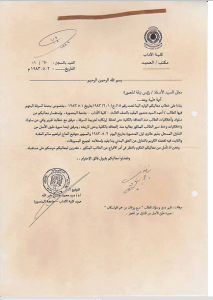 That’s the translation of the following letter addressed from Almansoura University to the Chief of Almansoura DA Office dated 2/5/1983 reference number 610/12. 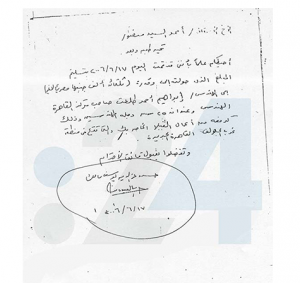 Ahmed Mansour is not only a thief, but he also got paid by the Businessman Wealthy Brotherhood Leader Hassan Malek for buying and decorating his Villa in the 5th settlement in Cairo Egypt. 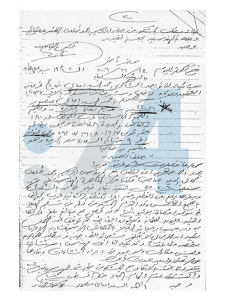 the following are 2 letters, sent from Hassan Malek to Ahmed Mansour confirming the transfer of 43000,00 USD and 300000,00 Egyptian Pounds, to the contractor who was working on his villa and also for decorations. 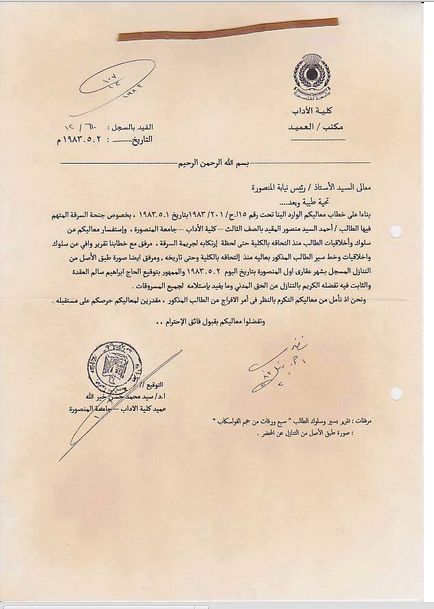 Hassan Malek asked Ahmed Mansour to withdraw the case he raised against the contractor, because he paid the contractor the money to finish Aljazeera Host’s Villa decorations and delivery! His Ex-Wife Wafaaa Alhameedy from Morocco, married to him in 2011, he divorced her after just 5 month from their marriage, when she discovered that he lied to her and that he was married to another woman and has children as well, and she threatened him to accuse him of lying and forging his statement in the marriage certificate. He threatened her that he is a very famous host in Aljazeera and he has very big contacts in QATAR like judges, royal family and very rich Businessmen, and he will destroy her if she raised a case against him! The following two videos, Muslim Brotherhood and their supporters showing videos of their victims and dead bodies, red color on the hands of one of the victims, that supposed to be Blood, playing dead and seriously injured. 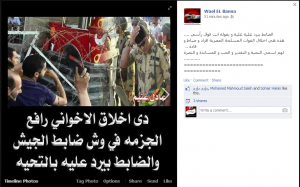 And it was marketed to the international Medias, as Brotherhood victims of the Egyptian Police and Military. Last Video, is really a miracle! Recorded and published by Aljazeera Qatar’s Official Media Channel. 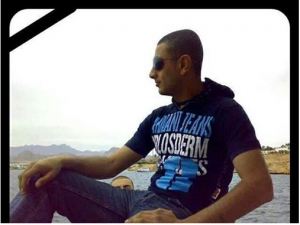 They said that the guy who is dying in the video, is one of the Brotherhood supporters, got shot by the Military and Police in his chest and stomach, and he was in Rabaa Brotherhood square hospital and doctors were doing their utmost to save his life. 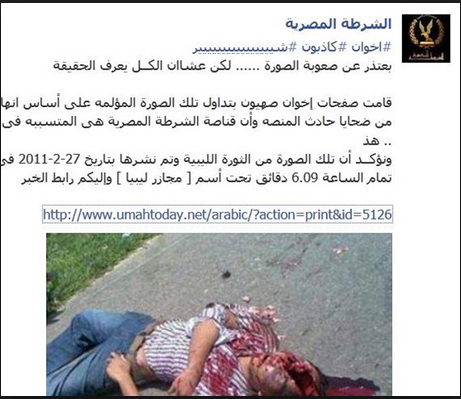 The video shows the Brotherhood victim dying, blood on his T-shirt, and totally in Comma. All of a sudden, when the camera man was trying to lift his shirt to show the world, the wounds caused by live bullets, the dying man, jumped and kicked the camera man strongly with his feet!!! 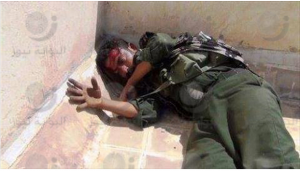 That was not the agreement of course with Aljazeera channel, it was just to film the dead body, but not to lift the t-shirt, the dying man, did not accept to let the camera man to lift his T-shirt, and decided to wake up from death, kicked the Camera man with his feet, then went back to death again!!! 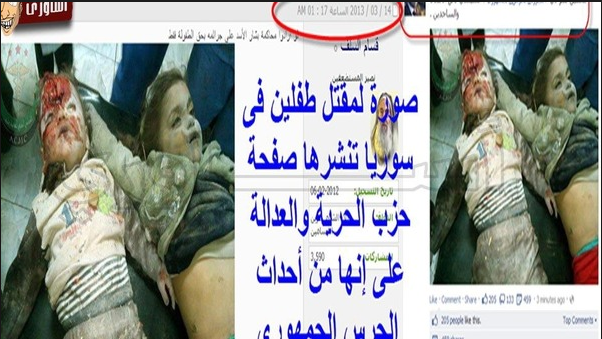 After Brotherhood marketed the videos to the foreign medias, the dead bodies came back to life again and the seriously injured ones, stood up and laugh. This is how foreign Medias work and specially Al-Jazeera Channel, the big Ally of Brotherhood in spreading lies and forged news!!! 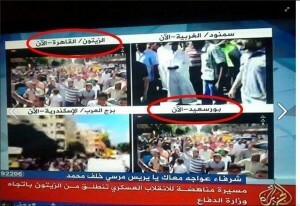 The following Video, aired by Aljazeera: It supposed to be demonstrations of MB in different cities, if you concentrate a little bit, you will see that they were just changing the name of the city but showing the same people in the same demonstration in two different cities at the same time. 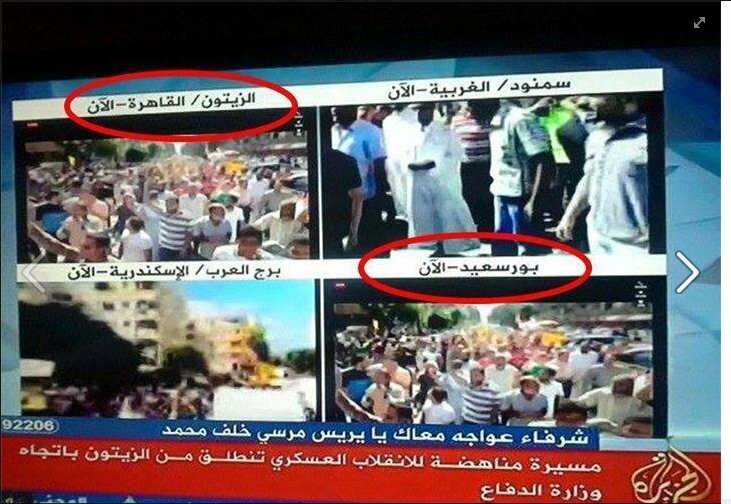 The following video shows demonstrations of MB supporters supposedly in different cities in Egypt, and Aljazeera is showing the same demonstrators, the same street, the same shops, cars and ADS signs in all screens the same, but the only difference is that they were just changing the name of the city, but if you watch it carefully, you will see that it is the same gathering repeated in all screens that was supposed to be in different cities. The following screenshot, image published by Aljazeera, claimed that the Egyptian military tanks are driving on Brotherhood innocent and peaceful protests!!! 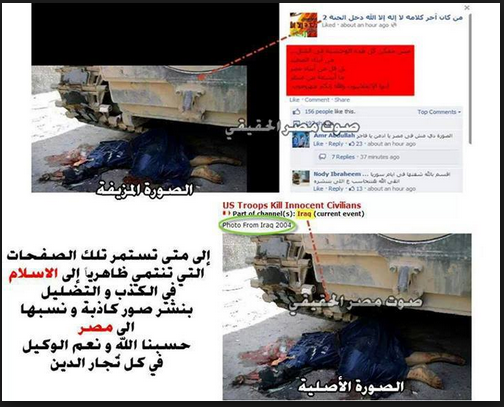 the one one the top is the fake one published by Aljazeera; the second screen shot is the original one took place in Iraq in 2004, US tanks / troops killed an Iraqi by mistake. 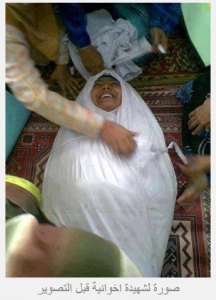 The following screenshot, is for a sisterhood, who is covered in a shroud, and she was supposed to be dead, as the brotherhood spread to the world, and right before Aljazeera takes the shot and report that the poor innocent girl was a victim of the Egyptian Military, Camera man decided to cheer her up while she was supposed to be dead in a few minutes, he was tickling her and she was laughing…Have you ever seen a dead body covered in shrouds, got tickled and laughing before she plays dead?!!!! 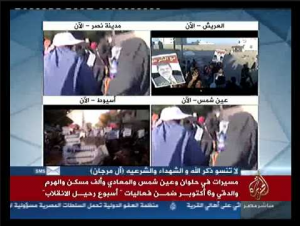 The following screenshot aired by Aljazeera, check the first one on the top left stating port said city Brotherhood demonstration, it is exactly the same of the one at the right bottom side stating brotherhood demonstration in Ain shams Cairo. 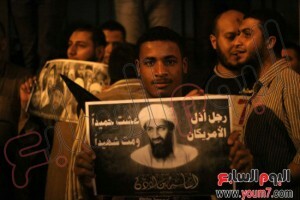 (and the bar title is stating millions marches in all Egyptian cities Brotherhood supporters demonstrating against the coup!). An Egyptian citizen lives in Mohandessin Sphinx square, revealed the fake news and aired faked videos about Brotherhood protests, the video shows Aljazeera airing huge demonstrations from Mohandessin Sphinx square, the Egyptian citizen aired directly what Aljazeera was airing live and moved the camera to the real scene from the sphinx square, which is right in front of his balcony, showing the square totally empty! 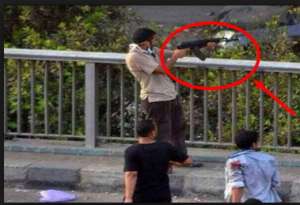 Aljazeera aired on 6/10/2013 and published that the Egyptian Military and Police have used live bullets against Brotherhood supporters and killed many demonstrators and injured many of Morsi’s supporters. 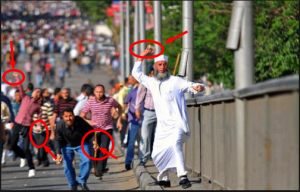 They claimed that Brotherhood protests were huge and all the Egyptians went out demonstrating in all the Egyptians Cities in Millions Marches supporting Brotherhood and Mohammed Morsi!!! 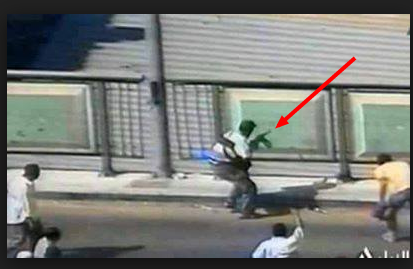 The following Video dated 4/10/2013, Brotherhood supporters attacking military and threaten them that 6/10/2013, the Brotherhood are going to slaughter them. 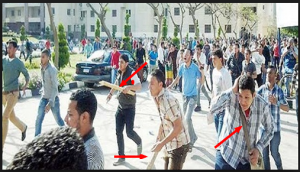 The following screenshot, Brotherhood insulting Military officers and provoked them, Brotherhood supporters were attacking Military individuals with shoes and the officers response was, thank you so very much, peace upon you guys. 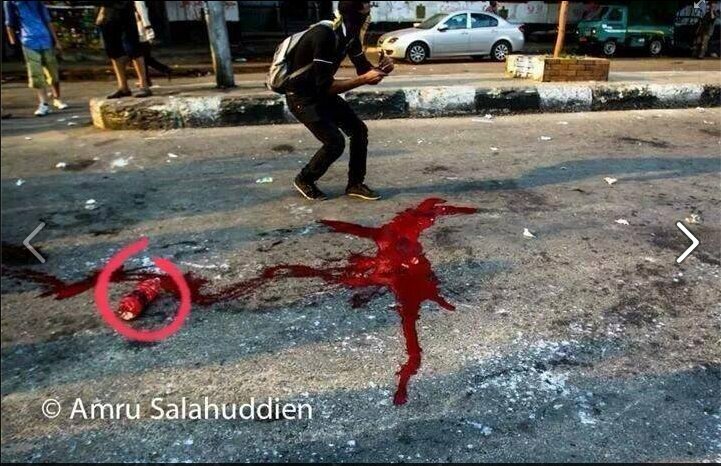 That’s what Aljazeera doesn’t show! 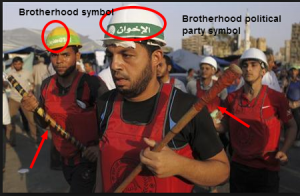 The following are just some samples I picked up from the Brotherhood accounts on the social Media, they are so many, it is very easy to recognize their accounts, either by Mohamed Morsi’s pictures or their hands 4 fingers yellow slogan. 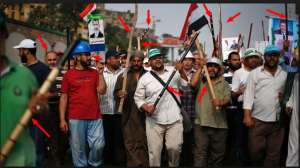 screenshot, they say hundreds of Brotherhood supporters are in Tahrir square right now 6/10/2013 and they are waiting for the signal to start as planned. 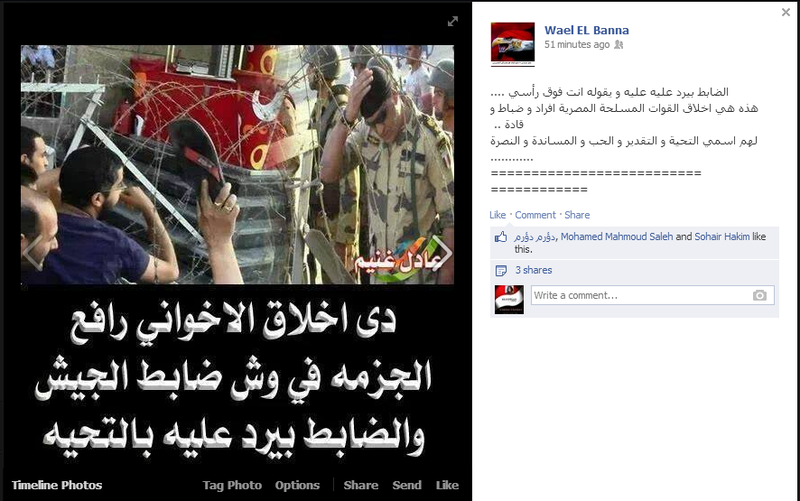 screenshot, they stated, wait for our surprise at 8 o’clock in Tahrir. 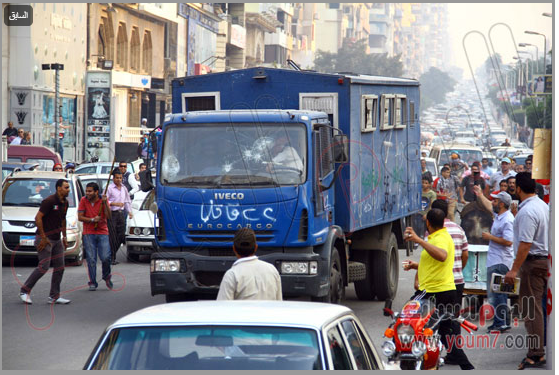 Do not fear the people who live in Rabaa nasr city area we know them well, they are all cheep and chickens and cowards, remember what we were doing to them when we had Rabaa sit in. 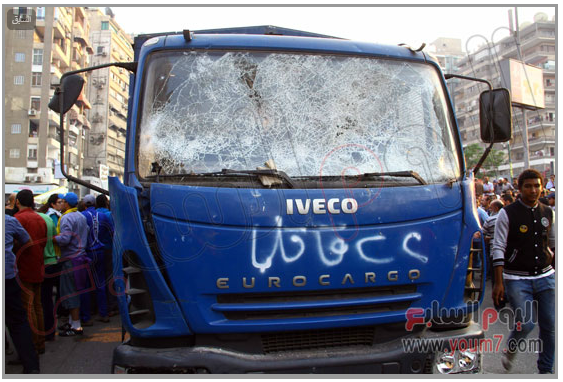 Our heroes are now attacking Tahrir square. Those who supported the 30 of June won’t enjoy it for too long, Morsi is coming back and we will hang all of them and Sisi as well. Video dated 6/10/2013, Brotherhood supporters are firing randomly live bullets at civilians in Ghamra Street – Cairo. 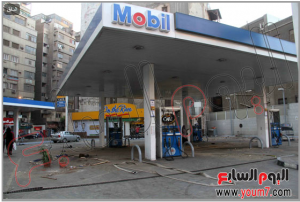 6/10/2013, Video Brotherhood burned the Dokki Traffic station- eye witnesses said they were shooting randomly at people in the streets and they burned the traffic station, while they were chanting that they were demonstrating peacefully. 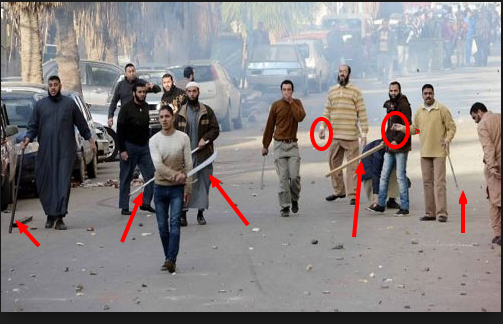 Video dated 6/10/2013, Brotherhood supporters burning trees, burning and damaging private and public properties and terrorizing people – in Ramsis Area – Cairo. 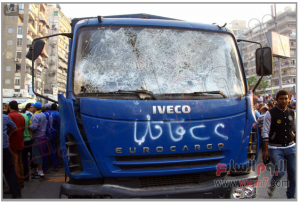 The following two videos dated 6/10/2013, Ramsis square clashes between Brotherhood supporters and the people who live in the area. 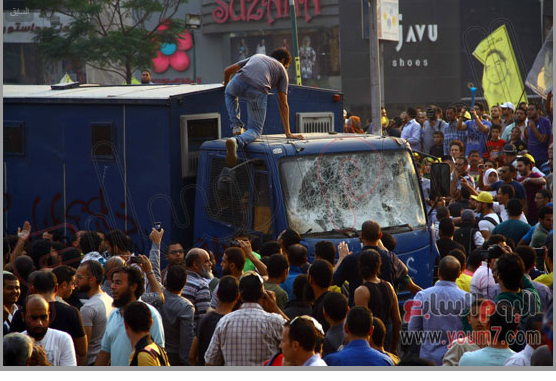 The brotherhood came to Ramsis square and start setting fire and damaged private and public properties. People went down to protect their properties from getting burned. You see clearly, the military standing in the middle try to stop both brotherhood supporters and people from attacking each other. 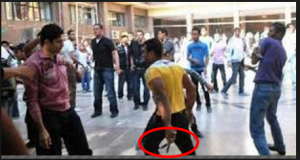 You will see military individuals on the brotherhood side, trying to convince them from staying away from the other side where people are standing, but they were keeping provoking people all the time either by attacking or very bad insults. The military did not attack brotherhood supporters as Brotherhood and Aljazeera claimed. Military in the two following videos were standing in the middle to protect Brotherhood supporters from the angry people, after Brotherhood supporters burned their private and public properties and terrorized them and stopped them from celebrating the 6/10 war victory. 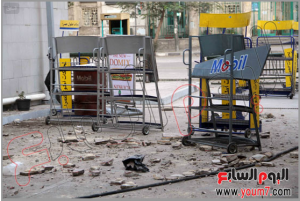 Video, 6 October 2013, Brotherhood damaged public property and destroyed the side walk in Alqasr Aleiny area. Video, 6/10/2013 – Brotherhood supporters attacking Al-Azbakeya Police station – a sound from a guy was calling the attackers to get back and not to attack the police station and another guy replied to him by saying no don’t call them to back off, let them fight the police and break into the police station. Video 6/10/2013, eyewitnesses in Ezbet Awlad Alam Cairo – he was injured when Brotherhood supporters attacked him and the people who live in the area because they were celebrating the 6/10 war victory, when Brotherhood supporters attacked them, they stayed in the street to protect their properties. 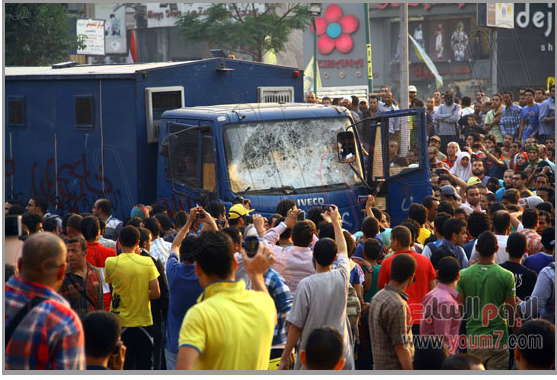 He added that a car was passing, and the driver was wearing a police uniform, Brotherhood supporters attacked him and was beating him, the people in the area managed to rescue him from their hands and took him inside one of the buildings, they went after them and they start to burn our properties again, so we manged to gather ourselves and we succeeded in kicking them out. 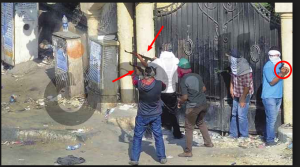 We are protecting our area and we saved the police officer from the brotherhood, who were beating the officer and saying kill him he is an atheist. 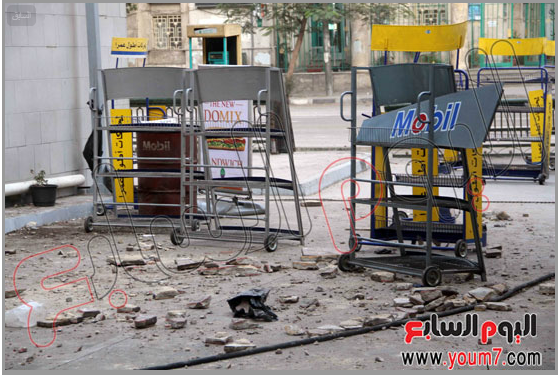 He also showed the cameraman the damages Brotherhood did to his shop. 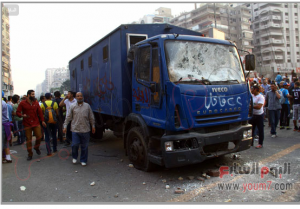 Video 6/10/2013, brotherhood supporters cutting the tramway road and blocked the road and attacking and terrorizing people with fire works in Zaitoun Area Cairo. 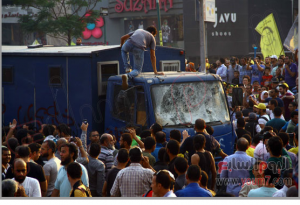 Brotherhood burned private cars in Ramsis square – Video 6/10/2013 – Eye witnesses said that Brotherhood were using Molotov and fire works, by placing them under the cars. Video dated 6/10/2013, Ghamra area – Cairo – Brotherhood supporters, those that you call peaceful demonstrators, terrorizing women and children in the metro and trying to break Glasses, besides damaging public properties. They were telling women and children inside the metro, today is your last day in this country, open the doors, let us in. Brotherhood attacking popular committees who were standing surrounding Tahrir square from MB attacks. 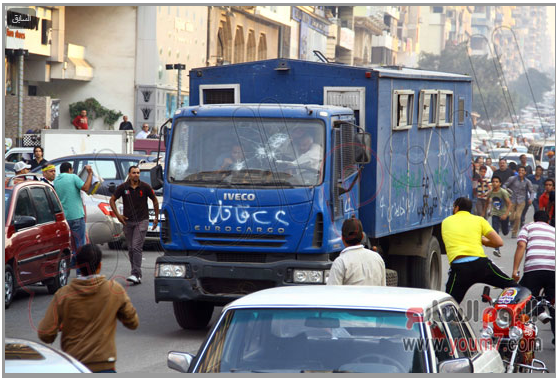 And protecting private and public properties from being damaged and burned by MB supporters – 6/10/2013 Tahrir Area. On the 7th of October 2013, Brotherhood and their Militias started terror attacks in different areas in Egypt and they took place almost at the same time. 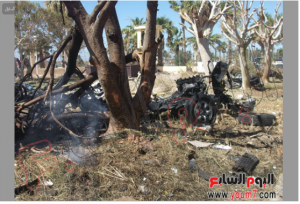 7/10/2013 – 5 military soldiers and one Officer got killed, and one soldier got injured after they got shot by Armed Militias on Sowair Road Close to Ismailia City, they were heading from their camp to Salheya Algadid. The name of some of the Military Martyrs: Lieutenant Ahmed Ibrahim – Mustafa Khidr – Abd Elnasser Fekry – Mahmoud Ahmed Abd Elrahman – Moaz Mohamed Nour – Mohamed Zakaria. 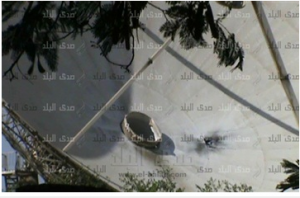 7/10/2013, MB armed Militias attacked Satellites headquarter in Maadi with two RBJ, one targeted the satellite functioning for International calls, the other one failed to hit the target – the following screenshot shows the satellite after the damages. 7/10/2013, In Behera City, Kafr Aldawar, a husband (Sobhy Gomaa Zedan, member in Muslim Brotherhood organization, and he works in the water company, tortured his wife (Soheir A. 44 years old) for two days, because of the 6th October celebration. 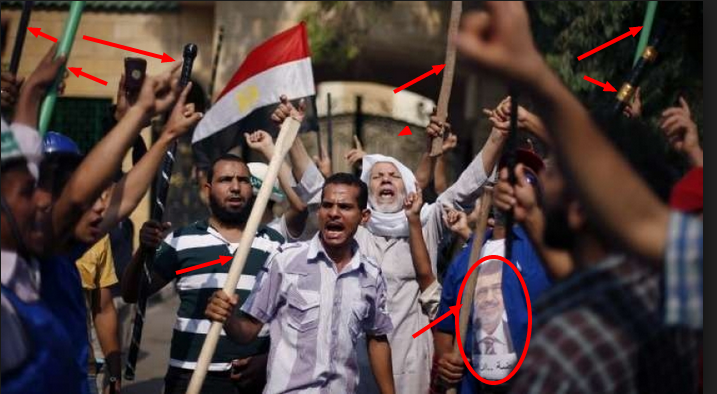 She refused to hang Mohamed Morsi’s picture in her bedroom and he caught her listening to one of the Egyptian national songs. The wife said that he was also torturing their child daughter by strangling and beating her. The wife added that he was beating her so hard and she was rescued by the neighbors when he was strangling her and her daughter. 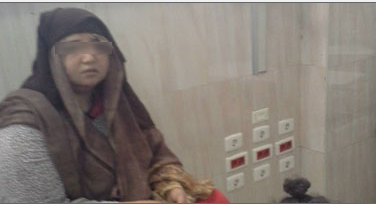 She made an official statement in Kafr Aldawar police station no, 4 dated 7/10/2013. 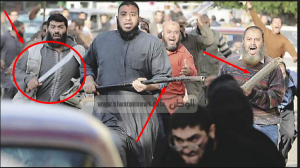 The following screenshots, you don’t see on Alzajeera or any International News Medias, because those who commit violence in Egypt, and carrying weapons, swords and knifes attacking the whole Egyptian Community, are not Muslim Brotherhood members nor supporters, they are Aliens coming from Planet Mars! You don’t need to carry a stone, a knife or even a gun to kill people, spreading lies and fake news whether deliberately or by mistake, kill innocent people too. I don’t believe for a second that the International news media are spreading lies on behalf of Brotherhood by mistake, your hands are covered with the blood of all Egyptians martyrs who got tortured to death, slaughtered, oppressed, thrown in jails by Muslim Brotherhood and their supporters, from the first minute they ruled Egypt, till this moment we speak.